While it’s not as flashy or extravagant visually in comparison to more recent Warner Bros. DC Comics-inspired superhero films, “Shazam!” does get a few very important things right. It’s got heart and an irrepressible “Golly gee whiz!” factor that’s critical to this property in particular and somewhat antithetical to entries in the genre more concerned with grit and violence. Add to those vital elements plenty of humor and a script that actually goes outside the lines from time to time and you’ve got a superhero movie that stands out from the crowd. When audiences meet 14-year-old Billy Batson (Asher Angel), it’s clear right away he’s a smart kid with a lot going for him. All except for his family situation — to be blunt, he doesn’t have one. In and out of Pennsylvania foster homes for years, Billy’s fixated on finding his real mother, who he was separated from when he was three. He knows she’s still out there, and he’s been using the skills he’s picked up to try to track her down. His quest gets sidetracked in a major way when he’s transported to a place called “The Rock of Eternity” by the wizard Shazam (Djimon Hounsou, “Captain Marvel“). The wizard calls upon Billy to take his powers and defend his magical realm from evil. Naturally, Billy’s a little skeptical. When he does as he’s told and says the wizard’s name, though, that skepticism gives way to complete freak-out as he’s transformed into a muscle-bound grown-up in a costume and cape. 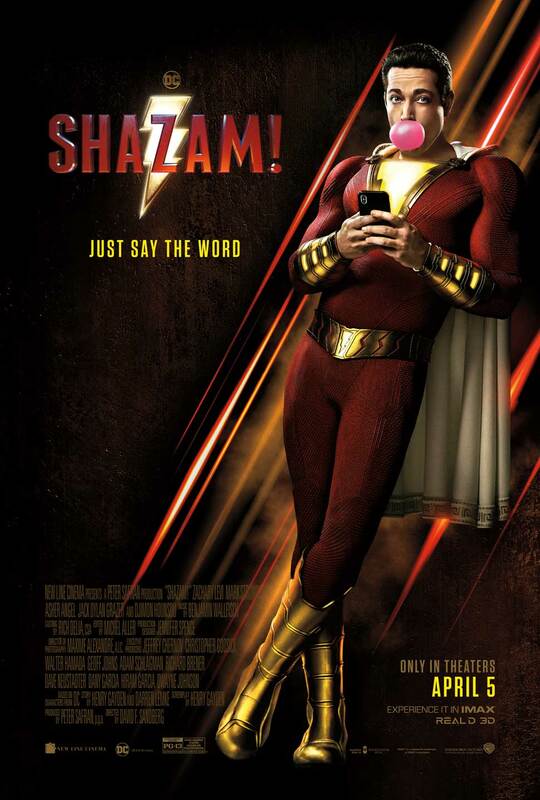 With the help of fellow foster kid and superhero fanboy Freddy Freeman (Jack Dylan Grazer, “IT“), Billy starts to figure out just what Shazam’s powers are. Super strength, super speed, bullet immunity, the ability to shoot lightning out of his hands — pretty exciting stuff! But when Philadelphia’s new superhero meets his match in Dr. Thaddeus Sivana (Mark Strong, “Kingsman“), Billy will need more than his new powers to save the day. He’ll need to learn what it means to put others first. He’ll need to learn what it means to be a hero. 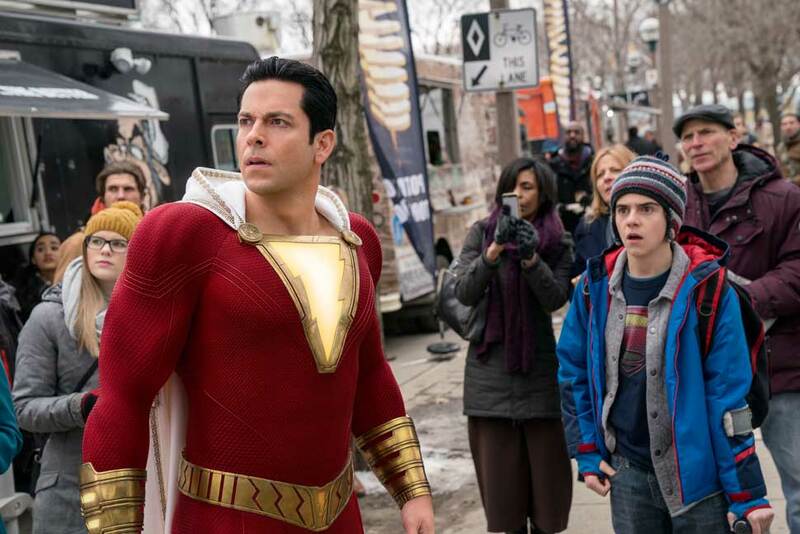 Audiences who have followed the DC Extended Universe films should notice right away that “Shazam!” is very different than its predecessors, and not just in terms of tone. What “Shazam!” does have is a potent grasp of what has made the character at its heart such a fan favorite since the 1940’s. “Captain Marvel,” as he was known first in Fawcett Comics and later in DC Comics, is all about wish fulfillment. Moreso even than Superman, this character derives his enduring appeal from that universal childhood desire to say a single magic word and have all dreams come true. For boys and girls of a certain age, to say that word and suddenly be able to do anything — to fly, to be invulnerable, to be the best version of yourself beyond anything you can imagine — the appeal could not be more relatable. Of course, the answer depends on the boy (or girl). The film does follow that line of inquiry as well, and it leads to places both familiar and unexpected. The fun of “Shazam!” starts and ends with Zachary Levi. In the title role as Billy’s grown-up alter-ego, Levi throws himself into being a pre-teen in a superhero’s body and the results are often hilarious. Asher Angel, who makes his feature film debut here, also deserves a Rock-of-Eternity’s worth of credit for his work. While Levi does the heavy lifting, figuratively and literally, Angel brings the film’s emotional heart. He delivers Billy’s innate goodness, his cleverness, and his independent streak all to life with genuineness and without saccharine. The other stand-out here is Grazer. He plays a solid emotional foil and sidekick for both Levi and Angel because the script allows Freddy to be more than just the hero’s mentor and conscience. He has his emotional arc to explore, and where it leads should leave audiences satisfied and wanting to see more. Again, it won’t blow you away with exotic special effects or superhero derring-do of epic proportions. What it will most likely do is leave you smiling, and thinking back to the child you might have been once upon a time, wishing you could say a magic word and change your world. Starring Zachary Levi, Mark Strong, Asher Angel, Jack Dylan Grazer, and Djimon Hounsou. Directed by David F. Sandberg.